Power P.M.P.O. 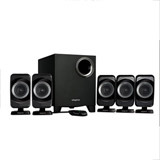 : 5100 w.
Speaker (150 x 75 x 90) mm. Subwoofer (260 x 160 x 190) mm.